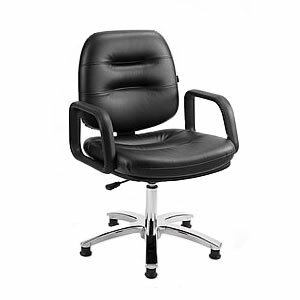 Direct Salon Supplies Palma styling chair in black on 5 Star gas lift base(5 Star base has adjustable glides to allow adjustment for uneven floors), also available on a round hydraulic base(please use the drop down box to choose). Cushioned seat and back for real comfort for your customers. Gas Lift available with a rotating or non-rotating gas lift (Please Use The Drop Down Box To Choose). Sizes Width 60cm, Depth 63cm, Height 88-102cm top top of chair back.